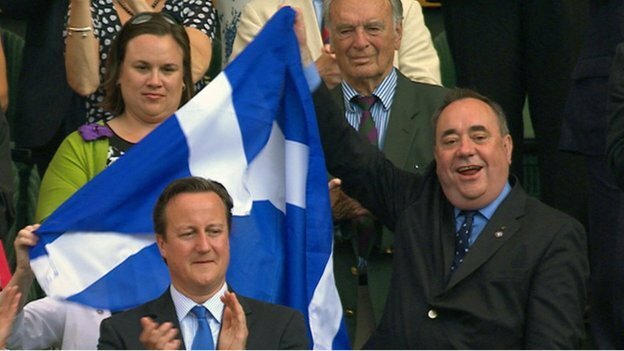 Alex Salmond waving the Saltire. I wasn’t going to write anything about Salmond waving the Saltire after Andy Murray’s victory, but the reactions — especially from unionist quarters — have been so strong that I decided to have a quick look at it. It’s against the rules of Wimbledon’s All England Club. It would have been OK for normal people to wave a Saltire, but a First Minister should be above such plebeian antics. The Saltire is a symbol of the Yes campaign, and as such it shouldn’t be displayed at a non-political event. Doing it behind Cameron’s head was wrong. 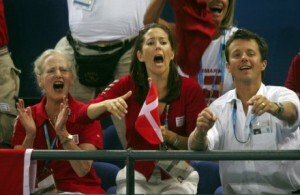 The Queen, the Crown Princess and the Crown Prince of Denmark at a handball match. No stiff upper lip there. Against the rules: While it might be against the rules, it’s hardly a huge crime, and I somehow doubt anybody would have been mortally offended if Đoković had won and the Prime Minister of Serbia had pulled out a Serbian flag. [During] James VI’s journey south in 1603 to claim the throne of his late cousin, Elizabeth of England, the people swarmed to welcome him in almost intolerable numbers. […] He asked what all these people wanted, and smooth-talking Englishmen replied they came of love to see him. He cried in Scots: “I’ll pull doon ma breeks and they shall see ma erse.” When he had spoken like that at home, his people answered in kind. That was how Scots treated their kinds, worthy of loyalty but on a level with themselves. The Saltire is the symbol of the Yes campaign: If this is now the case, it follows that the Union Jack is now the symbol of the No campaign, and both should be banned from non-political events until the referendum has taken place. This would be rather perverse, given that both flags primarily are symbols of their countries, not of political movements. Not behind Cameron: I fail to see how waving a Saltire behind Cameron’s head can be seen as offensive. Downing Street were flying a Saltire that very same day, and Cameron is the Prime Minister responsible for Scotland, as well as being of part-Scottish descent. If I had been Cameron, I would have turned round and waved it together with Salmond. To conclude, it doesn’t strike me that any of the reasons given for being outraged really hold water, so it’s more likely it’s simply the No campaign trying to throw mud at their opponents.